When it comes to Boxing no one is a more exciting top prospect than Gennady Golovkin, better known as GGG. Golovkin is actually quite a ways past being a prospect at this point, as he is a dual-world champion, but at this point he is a prospect for being the very top of a generation of fights, which is a feat in and of itself. Last night he fought the tough-as-nails Curtis Stevens in New York and both men put on an amazing show. 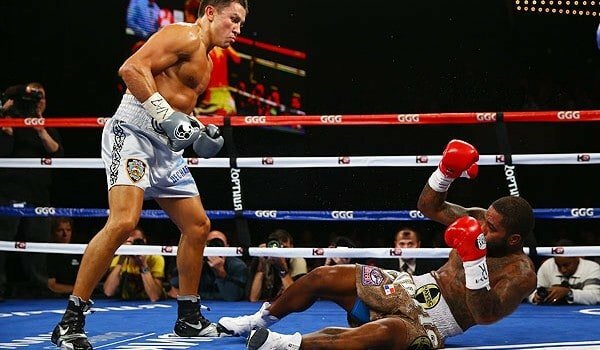 Part of what makes Golovkin such a fan favorite and so great to watch is that he throws caution to the wind and fights in an aggressive, devil-may-care manner at times, which has scored him an impressive 25 knockouts in his 28 fights. Last night Curtis Stevens landed a few great shots on Golovkin, but Golovkin’s chin held up and Golovkin was able to win every round until he battered Stevens bad enough for his corner to throw in the towel in between rounds. So I urge you to head over here and check out this highlight of the fight, then try to catch the fight itself, as it was awesome.